I'm a Friend and I support FWN! Bring up to 10 comp guests. Your corporate logo with hot link to your site on all eblasts and FWN website. 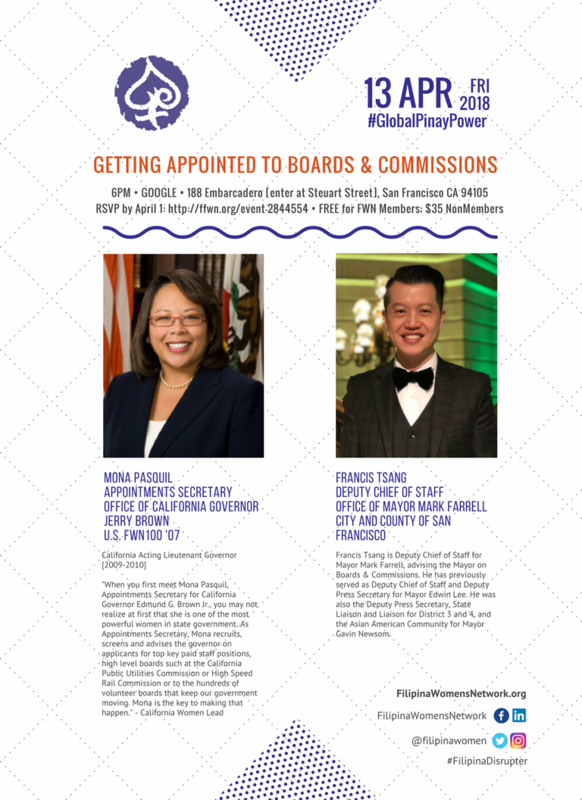 Want to be appointed to a state/city board or commission? So you've made it to a successful career. You're comfortable. You're financially set. What's next in your career path? How do you become much more relevant to the issues women face? How do you develop your public voice? How do you secure that "seat at the table" where decisions are made impacting our lives, our families, our communities? How do you get involved in the issues in your community? Here's your next step from success to relevance! Learn the nuts and bolts on getting appointed to a state or city commission or board. MEET the two individuals who can make it happen for you. \Bring a 2-page resume [This is important. More than 2 pages does not reflect well on you]: One set if you're interested in a state commission; one set if you're a San Francisco resident and interested in a city commission. 2 sets of resumes if you're interested in both! We're collecting at the meeting so we have folders of qualified women's resumes for both Mona and Francis. NOTE: 1) This is Governor Brown's last year in office so get your name in now; 2) San Francisco is electing a new Mayor on June 5. Now is a good time to consider a board/commission appointment.